Own Birds Of A Feather Series 1 to 9 (BBC) 1 to 3 (ITV) Complete Collection DVD from Deff, DVD, Blu-Ray & 4K Video Specialists - Free UK Delivery..
Own Birds Of A Feather Series 1 to 9 (BBC) Complete Collection DVD from Deff, DVD, Blu-Ray & 4K Video Specialists - Free UK Delivery..
Everyone's favourite Essex girls return with this fifth series of Birds of a Feather - one of the 1990s' most successful, long-running and memorable sitcoms. This release comprises all thirteen episodes of Series Five along with the 1993 Christmas Special, featuring guest appearances by George Hamilton, George Wendt and Richard Branson. Created by the legendary comedy partnership of Laurence Marks and Maurice Gran (The New Statesman), t..
Own Birds Of A Feather - Christmas Specials DVD from Deff, DVD, Blu-Ray & 4K Video Specialists - Free UK Delivery..
Own Birds Of A Feather - The Christmas Collection DVD from Deff, DVD, Blu-Ray & 4K Video Specialists - Free UK Delivery..
Own Birds Of A Feather Series 1 DVD from Deff, DVD, Blu-Ray & 4K Video Specialists - Free UK Delivery..
Own Birds Of A Feather Series 1 to 2 DVD from Deff, DVD, Blu-Ray & 4K Video Specialists - Free UK Delivery..
Own Birds Of A Feather Series 1 to 3 (ITV) DVD from Deff, DVD, Blu-Ray & 4K Video Specialists - Free UK Delivery..
Own Birds Of A Feather Series 2 DVD from Deff, DVD, Blu-Ray & 4K Video Specialists - Free UK Delivery..
Own Birds Of A Feather Series 3 (ITV) DVD from Deff, DVD, Blu-Ray & 4K Video Specialists - Free UK Delivery..
Own Birds Of A Feather Series 3 DVD from Deff, DVD, Blu-Ray & 4K Video Specialists - Free UK Delivery..
Own Birds Of A Feather Series 4 DVD from Deff, DVD, Blu-Ray & 4K Video Specialists - Free UK Delivery..
Everyone's favourite Essex girls return with this sixth series of Birds of a Feather - one of the 1990s most successful, long-running and memorable sitcoms. This release comprises all thirteen episodes of Series Six along with the 1994 Christmas Special, featuring guest appearances by Michael Winner and designer David Emanuel. Created by the legendary comedy partnership of Laurence Marks and Maurice Gran (The New Statesman), the series ..
Own Birds Of A Feather Series 7 DVD from Deff, DVD, Blu-Ray & 4K Video Specialists - Free UK Delivery..
Own Birds Of A Feather Series 8 DVD from Deff, DVD, Blu-Ray & 4K Video Specialists - Free UK Delivery..
Everyone's favourite Essex girls return with the ninth and final series of Birds of a Feather - one of the 1990s' most successful, long-running and memorable sitcoms. This set comprises all six episodes. 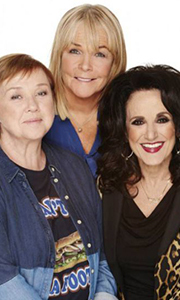 Created by legendary screenwriters Laurence Marks and Maurice Gran (The New Statesman, Shine on Harvey Moon), the series chronicles the misadventures of Sharon and Tracey (Pauline Quirke and Linda Robson) North London-born sisters left ..